Tomorrow is World Water Day, so I thought there’s no better time to unveil Busabout’s latest initiative with Just a Drop, a Treadright endorsed organisation that provides sustainable safe water, sanitation and hygiene projects to communities across the world. They are currently supporting three villages in Cambodia and money contributed by Busabout will go to directly help these Cambodian villages have safe drinking water for its residents. The world is currently facing a huge plastic problem, which is highly prominent in Asia. In Cambodia it is estimated that around 4.6million plastic bottles go to waste every month. To try and combat this problem Busabout is now selling refillable aluminium water bottles to its passengers on the Cambodia Adventure trip. 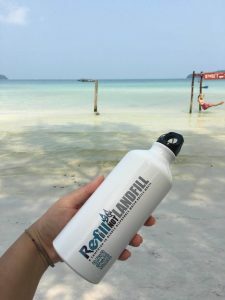 These water bottles are provided through Refill not Landfillwhich is a Cambodian company that is striving to reduce the plastic usage of tourists and tourism companies in Cambodia through providing refillable bottles and refilling stations across the country with which to refill these bottles. Currently they have over 83 locations across Cambodia to refill their branded water bottles and have just started to expand into Vietnam and Thailand. Busabout created a great design to be put on the water bottles which you can see attached, making for a great souvenir for passengers on trip as well as giving them the opportunity to give back and help the local community by reducing their plastic usage whilst in the country. To add to the giving back nature of these Refillable Water bottles, Busabout will be donating all proceeds from them to Just a Drop. 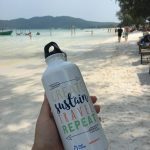 These water bottles are sold as part of Busabout’s Angkor Wat sunrise excursion, and passengers opting in for the experience will receive one of these fantastic bottles. Busabout strives to make a difference in the countries its guests visit in Asia and Europe for everyone involved – its team, suppliers, agents and passengers alike.